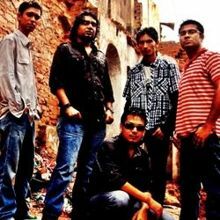 Prithibi is a Bengali Rock band officially formed in Kolkata, India in the year of 2005. But its original formation goes back to 2001 at Ashutosh College. Recently band members are Kausiq is a Lead vocal, Sharad is Guitarist, Prosanto is a Bass and Backing Vocals, Raja is a Guitarist and backing Vocals and Arnab is a Drummer and Percussion. The band become more popular with audiences when they stood first runner up in a competition Band-E-Mataram held in Kolkata by a music channel Sangeet Bangla record label Asha Audio and Sangbad Pratidin in 2005. Their music is a blend of various genres like Classic Rock, 80s glam Rock, Metal and Bengali Rock along with modern poetical lyrics written and composed by Kausiq. The band base was set in 2001 when three Ashutosh College Students, Kausiq, Abhijit and Souvik joined together to form a band Prithibi was found. Before they forming the band the three of them used to play in Canteen and performed in Colleges function together among of them Kausiq was performed as solo artist and did many projects in Kolkata and Out of Kolkata. The band experienced a flurry of line Up changes Until 2005. Their first titled album released under one of the major record labels Asha Audio in the year 2007. Their second album Chapter II released under the same record label in 2010. This album was hugely popular and was also nominated in the Zee Bangla Gaurav Samman Awards, 2011 in the category of Best Bangla Band Album. Their guitarist, Bubun died on 17 November 2012 Later Sharad Diyali joined as the Guitarist of the band. Prithibi band also did many projects like Prithibi has also composed the 'Kolkata Police Friendship Cup, 2007'. It was the same year, when 'Friendship Cup' entered into the Limca Book of Records, Did music direction for a Telefilm, 'Bombagorer Nattyo Company' in the year 2006, Composed a song for Radio Mirchi especially for Poila boishakh, Composed a song, 'Ray of Hope' for ARRAY, an NGO which works for underprivileged children. The song was sung by Prithibi and Usha Uthup and many more. The lead vocalist of Prithibi Kausiq is doing his debut as a music director for two films at a time 1st one is "Help Line" and 2nd one is "Saare Char". He is also doing his debut as actor in that film. In that film music the lead vocalist Rock Band Cactus, Siddhu is singing on Kaushik's tune. Why Book Prithibi Through ArtiseBooking?